Financial model and project finance models in particular generally require a sources and uses section to explain where the money is coming from and how it will be used at a given point in time. The actual sources and uses statement is fairly straight forward and can be generated out of the cash flows statement and balance sheet. However, a great way to display the information is to use a column chart as shown below. The trick is to set the sources and uses as separate columns. You can easily change the order of the items to make more sense e.g. 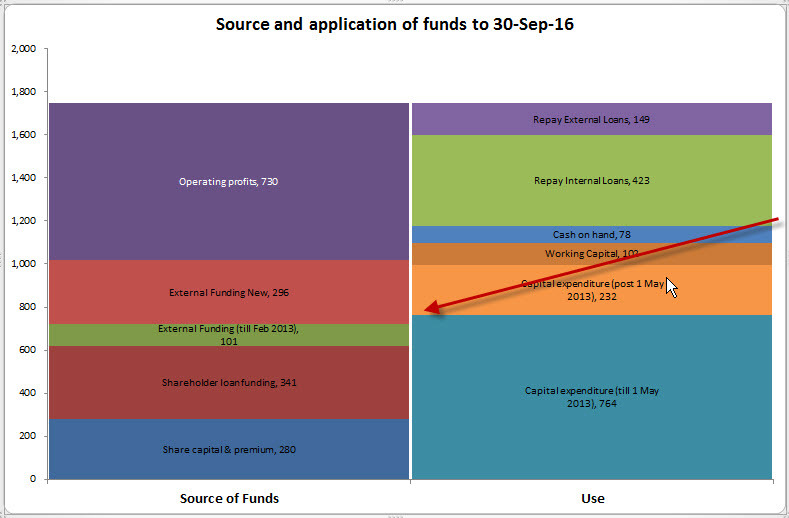 below, all the capex is show in the uses and the sources of funding involving shareholders or debt are shown adjacent to it. In this way it is easy to see what is happening.